Lenovo Unveils A Trio Of New Android Tablets. 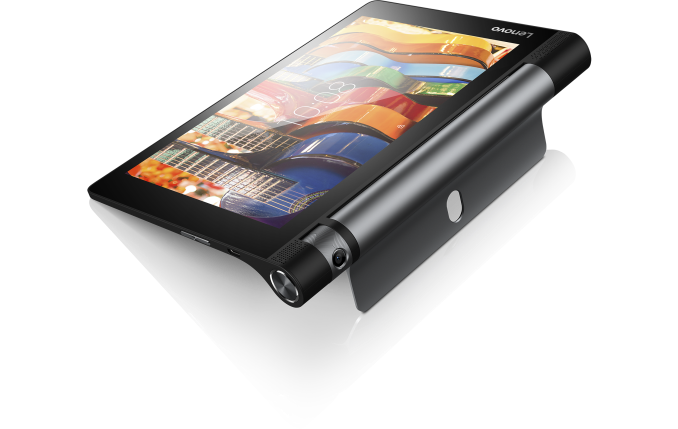 Today Lenovo has launched three new Android tablets in their YOGA Tab series. In order the new devices are the YOGA Tab 3 8", the YOGA Tab 3 10", and the YOGA Tab 3 Pro 10". The first two tablets are fairly low-end devices, while the YOGA Tab 3 Pro is probably the most unique Android tablet that I have ever seen. You can see how these tablets compare to each other by checking out the spec table below. The YOGA Tab 3 8" and 10" use Qualcomm's Snapdragon 212 SoCs, which are both quad core Cortex A7 parts with Adreno 304 graphics. As for the Yoga Tab 3 Pro 10", it's a much more interesting situation. This is one of the first devices shipping with an Intel Airmont SoC, and to my knowledge the first and only Android device to do so. This is Intel's first Atom SoC built on their 14nm process, and it consists of 4 Atom cores with a peak frequency of 2.24GHz, along with a 12 EU implementation of their Gen8 graphics. Moving on to the displays, we see that both of the non-pro YOGA Tabs use a 1280x800 IPS LCD. The YOGA Tab Pro steps up significantly with a 10.1" 2560x1600 IPS LCD. It's fairly clear that the non-pro YOGA Tabs are intended to be low-end tablets, with the pro model packing the more powerful specifications. One that immediately pops out is the battery capacity. At 38.76Wh, it is the biggest battery I've ever seen in an Android tablet, and it rivals the enormous batteries that Apple had to put in the 2012 models of the iPad. Lenovo claims that the YOGA Tab 3 Pro 10" will last up to 18 hours on its battery. The YOGA Tab 3 Pro 10" also has a couple more interesting features. While both of the non-pro models feature two front facing speakers positioned in the tube at the end of the device, the YOGA Tab 3 Pro 10" has four front-facing speakers, along with Dolby's Atmos 3D surround sound processing. It also features a pico projector that can project an image up to 70" in size with a brightness of 50 nits. Lenovo states that the projector can be rotated using gesture controls, although it's not explained exactly how this works or what it entails. Lenovo hasn't set a firm date for the launch of any of these tablets, but their press release states that these are part of their holiday lineup, and so if you're interested in buying one you should be able to pick one up sometime in December at the latest. Prices for the YOGA Tab 3 8" and 10" are unknown, but the YOGA Tab 3 Pro 10" is priced at $499 for the WiFi model, and $599 for the LTE model. The 2 cheaper models made me lol, those are worth 70 and 100$ and maybe they should have something more interesting than that. The Yoga 3 Pro is more interesting but less interesting than last year's model. The screen res stagnated, 2GB of RAM is too little for a 500$ tab, the SoC is underpowered and likely the projector is again low res. Last year's offer was quite interesting,this is so much less. At 300$ it would be as appealing as last year's model was at 500$.